This article describes the different Kongs, possible fillings and uses and why I think they are one of the best dog toys. Having owned and looked after dogs of different breeds I have found the dog Kong toy one of the best toys to keep a dog amused and happy. Dog Kong Toys are great for many dogs. I have had my own dogs and rescue dogs in foster and many of them just loved this toy. There are many different sizes of toy and if you are imaginative you can stuff it full of treats that will keep a dog occupied for hours. It can also be a fun throw activity toy. You can use it with dogs of all ages, shapes and sizes and puppies. I have found it helps when leaving a dog alone or when you just need to get on with other things. It can be helpful for feeding issues and it is a lovely treat for dogs. It is also a great present for your own dog or friends dogs or if you buy gifts for a rescue centre at Holiday times. The Kong is essentially a thick natural rubber shaped dog toy. It is designed to be chewed and as long as you get the correct size for your dog is pretty tough. It can be filled with a variety of treats. If thrown or rolled its shape means it goes in an unpredictable direction so can be a great fun throw toy as well. There are Kongs available for puppies and small breeds right up to very large powerful breeds. There is the original classic Kong, the Kong for puppy teething, the Senior Kong and the interesting Genius Kong to name a few variations. This is the Classic Kong -below- I used most for when I had my dogs Labrador and Golden retriever. It was large enough for them to hold and carry which they loved to do, but not too small that it was a choke hazard. It also always seemed about the right size and toughness for them to enjoy chewing it and it lasted a very, very long time. The Kong can be bought for just one dog or it can be sometimes available in packs of four or many more which may be useful if you have several dogs or want a good bargain buy or if you run dog day care or similar and want to be able to offer a great dog toy to your customers. Any of the links here will take you through to Amazon.com to explore more varieties of Kong. A super tough Kong for the big dogs who are big chewers. 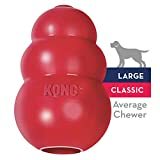 If you have a large or very large dog or a dog who is a powerful chewer this is the Kong you need. If you have tried other Kongs and they end up chewed up rather quicker than you would expect do try this one for your dog. Some dogs just need an extra strong dog toy and this is one of the strongest. Here are a few of the fillings I have used in the Kong. Just see which ones your dog likes. In my experience a frozen Kong lasts a lot longer than a non frozen filling but you will see what your dog likes and how fast they are are getting all the filling out. It is useful to put a few pieces of normal dog or puppy kibble right into the small end of the kong as sometimes dogs can get frustrated if food is stuck at the end and they cant get it out. So if they get that far the kibble will generally drop out. A cheese Kong can also be frozen. For this you can use any paste your dog likes, I have found the favourite to be chicken. Simply squeeze or spoon the paste into the Kong and give to the dog. If you find your dog gets through this very quickly then try adding some kibble into the paste to slow him or her her down a bit. You can also bung up the ends with a big piece of kibble or hard cheese. A frozen yoghurt Kong was my gorgeous Goldens favourite treat. He loved yogurts anyway and would simply sit and drool if ever we were eating one as he knew he would get to lick the pot out ! So to give him his very own was sheer bliss for him ! This is an incredibly easy filling to do for the Kong of any size. Just pour some yoghurt into the opening of the Kong. I use only natural, organic unsweetened yoghurt. I find its easier if you use the slightly thicker consistency yoghurt as well. Then either bung up each end of the Kong with a piece of cheese or wrap loosely in a bag or both. Then simply put into the freezer. You will want to take it out when it is frozen. Then I tend to leave it for just a few minutes out to take off the hard frost then give to the dog. I find this an especially good treat when its really hot day. It is also one of the longer lasting Kong treats for even the most speedy of chewers! Of course you have to see if your dog likes yoghurt but if he or she does then its a great filling. I have not used a Kong genius yet but it looks interesting . I would see the Kong genius as being good for the dog who likes a puzzle, finding treats and being active with their toys. I would probably use this one more to have as a game and activity rather than a toy to be in his bed and lick. If you stuff it with kibble the dog can shake it and move it around to get the kibble out gradually. It also looks like you can make it easier or more difficult depending how many attachments you add so it is a toy that could grow with the skills of your dog. I think its a great idea. The dogs in the video certainly look like they are having fun. Most of the time in my experience there is very little in the Kong left to clean out ! However if there is its easy to just rinse it out under the tap(faucet) and wash it through in soapy water. Rinse really well and leave to air dry before the next use. I always clean out after each and every use, it only takes a few minutes and keeps it clean and hygienic. I always kept mine well out of reach of our dog though as he would go get it if he saw it! As the Kong will get a lot of chewing and pawing and may well be thrown about as well do inspect if often. A certain amount of teeth marks is to be expected but if you see missing chunks or shards or any especially rough edges then its time to throw it away. I find they last a very long time but of course it depends on the dog. It is also why its important to go for the correct size for your dog. Too small and you have a chocking hazard and it will get chewed up, too big and the filling will drop out too easily and your dog will not be able to carry or play with it well. Luckily there are a variety of sizes to suit most dogs. It is very important to keep our dogs a a healthy weight for their breed and size. If you like to use the filled Kong a lot with your dog and especially if using high fat contents then it is worth reducing his food ration a little and using his food mixed up with the filling in the Kong. If you don't do this he may start to put on weight if he is getting his normal food allowance plus a filled Kong several times a day. Just keep him to a healthy weight for him. Using The Kong While You Are Out. We never left our dogs alone for more than a few hours but we always found it helped to leave them something to do at the point of leaving. So we would make up a usually frozen Kong and settle our dog in his bed and just before we left give it to him. He then focussed on the Kong instead of us leaving and the car driving away etc and usually after licking all the ingredients out of the Kong settled down for a nice sleep. It always seemed to have a calming effect on him. Of course if you are going to do this you will need to see how your dog reacts to the kong. Our own Goldie dog tended to stay in his bed and lick it until he was tired, often falling asleep with it in his paws...sweet boy. However one dog we looked after would get very excited over it and throw it up in the air! So just know your dogs likely reactions before you use it as a pacifier while you are out! It is also vital that you use an appropriately sized Kong, too small and you are risking a choking or swallowing hazard so be careful. Of course always be careful with puppies. A very useful addition to the Kong range. This little kong is great for tiny puppies and little dogs up to five pounds in weight. Your small puppy can chew away to his or her hearts content and play with this Kong. It can be useful if you want to crate train your puppy to give him or her something to keep them occupied and a pleasant experience associated with the crate. 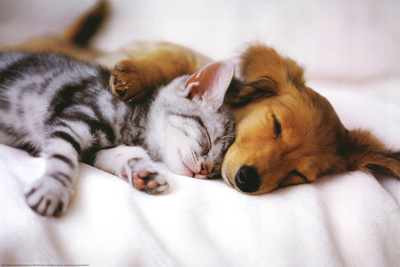 Hopefully you will end up with a very happy and tired puppy. 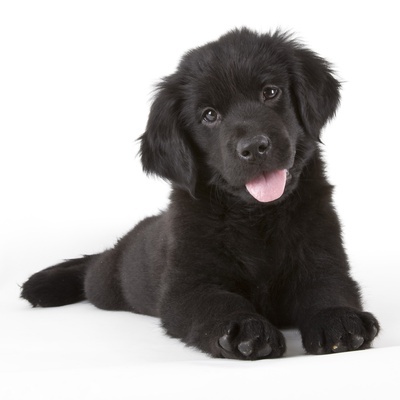 Puppy teething time can be hard on your pup and also on you and your home. Your puppy needs to chew. If you are looking to save your furniture and rugs you need a more fulfilling alternative. The best thing is to provide your pup with suitable chewing toys and items that will not harm his or her gums and teeth. Things like frozen carrots can be good and I have used them. They have proved good and popular with the puppy. The cold is soothing against the teething feeling. However it was a little messy once the ice melted and the carrot was, by this puppy, mashed up rather a lot ! 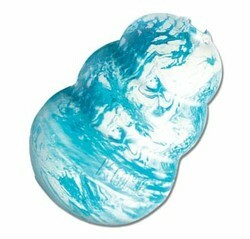 This special teething Kong can also be frozen but will be less messy and last longer. In addition to a treat or playtime a Kong can also be a very useful help at feedtime. Some dogs will bolt their food and in some they can risk health issues doing this. One dog we looked after practically inhaled his food and it was a worry. A possible solution - but do check with your vet- is to provide at least some off the food in the kong. It really slows down the rate at which the dog can eat. A Kong may also be helpful if a dog seems disinterested in food from his bowl. Some dogs like to work for their food. Also in one case we had a rescue foster dog scared of the bowl, we think it was the sound the metal bowl made, but she would eat from the Kong while we slowly introduced the bowl as a good thing in her life. What Do You Think Of The Kong Dog Toy? Hopefully I will soon be the new foster mom for a dog through the Last Hope Rescue and I am sure I will need a chew toy or two and the Kong sounds like the best buy. It is wonderful if you are thinking of adopting some day when are ready. You will know when the time is right, and when you meet the right dog for you. Thank you @Raintree, yes it is, but so many need homes so I am keeping my eyes and heart open. Thank you ! I appreciate that :) Sending Hugs I understand how hard it is to lose a beloved dog. This is such a great and detailed page on Kong toys. I wanted to get one of these for my yorkie when I finally discovered them...a very small one, but that wasn't to be...perhaps my next dog, my heart is ready to open and bring another dog into the home after the passing of our Yorkie a year ago. Yes I have liked them for all our dogs and our foster dogs, some like to play with them , most enjoy a chew and seeking the treat inside! The Kong toys really are the best! All of our dogs have loved them. Kongs can be such great fun for dogs! Depending on what you fill them with can keep them well occupied. Goldie could get kibble out fast! but frozen yoghurt or paste topped with kibble kept him busy for ages. My brother's Boston Terrier LOVES her Kong - both chewing on it for the kibble treats (which she can get out in just minutes) and having us throw it (over & over...LOL) for her. Every wondered how to make those durable, box-braid or square braid dog tugs for your agility or flyball dog? Here's step by step instructions. With pictures. Dogs need toys to entertain themselves, but not every dog toy works for every dog. You may need to go slowly at first, and buy more after you know what works for your dog.